Belfast International Airport offers convenient parking options with over 8000 spaces. There are different options for car parking. Here we will discuss on Belfast International Airport Parking Prices, Promo Code & Park and Fly Reviews in detail. Main Car Park situated in front of the main terminal is much convenient for business and short break passengers. It is just at 2-3 minutes’ walk from terminal. It has secured barrier control and is ideal for few days park. You can book online for the parking space or can park directly and pay on exit. You can make huge saving by pre-booking. The turn up gate parking charges for are: £2.50, £4, £3.00 per hour, £25 for time slab of 0-30 minutes, 30-60 minutes, 1-8 hour and 8-24 hours respectively. Thereafter it is £20 per day. Long Stay Car Park at Belfast International Airport is only 5-6 minutes’ walk from the terminal. The airport provides shuttle bus to go to terminal on request. The long stay parking is much suitable to those who want to park for more than 4 days. You can book parking space online. If you pre-book, the parking is offered at price of £3.49 per day; it saves you up to 65%.The turn up gate prices for parking are: £17.50, £27.50, £35, £42.50, £50, £55, £60, £65 for parking time of 0-15 minutes, 15 min – 1 day, 2 days, 3 days, 4 days, 5 days, 6 days, 7 days and 8 days respectively. Short Stay Car Park is just 1-2 minutes’ walk from terminal; it is ideal for drop-up passengers. Blue badge holders are allowed to park here. You can pre-book parking online. The turn up gate prices are: £1.00, £2.50, £3.50, £5.00, £4.0 per hour and £35 for 0-30 minutes, 10-20 minutes, 20-30 minutes, 30-60 minutes, 1-8 hours and 8-24 hours respectively. Thereafter, it is £35 a day. Park and Fly is a low cost parking available from Belfast International Airport suitable for long as well as short stay parking. It is just at 2 minutes shuttle distance from the airport; free shuttle bus services to the terminal and back are provided by the airport. Parking charges are just £3 per day. 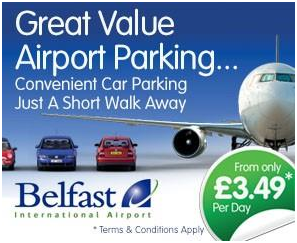 You will find Belfast International Airport Parking Promo Code at several third party websites. By applying the promo code, you will get certain discount; you can make huge saving on parking by using promo code. The Park and Fly parking services is Belfast International Airport the most economical and convenient parking option. It is much secured. It is quite close to the airport and the shuttle bus services to and fro from the airport are frequent and you don’t have to wait longer. It is the closest off-site car parking facility to the Airport and saves you on parking prices. Park and Fly parking at the Belfast International Airport is a good parking option for short as well as long stay car park.